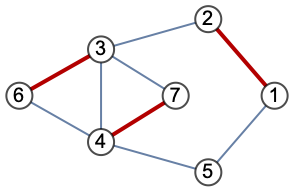 finds an independent edge set of the graph g with a maximum number of edges. An independent edge set is also known as a matching. An independent edge set is a set of edges that are never incident to the same vertex. FindIndependentEdgeSet returns a list of edges. FindIndependentEdgeSet works with undirected graphs, directed graphs, weighted graphs, and multigraphs.